Dangan Road, Thomastown, near the scene of the incident. GARDAÍ ARE INVESTIGATING a fatal road traffic collision in Co Kilkenny in which an elderly man died. 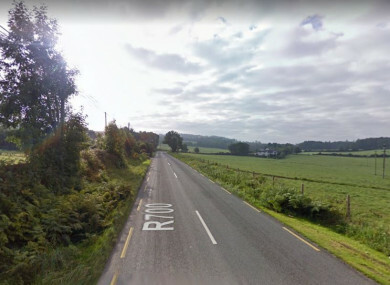 The incident occurred on the main Thomastown to Inistioge Road at Dangan, around 2kms from Thomastown, at 8.10pm last night. A car collided with a ditch and the 73-year-old driver, the sole occupant of the car, received serious injuries. He was removed to St Luke’s Hospital in Kilkenny where he died in the early hours of this morning. The scene of the collision has been examined by Garda Forensic Collision Investigators, and the local coroner has been notified. Gardaí at Thomastown are appealing for witnesses or anyone with information to contact Thomastown Garda Station on 056- 7754150, the Garda Confidential Line on 1800 666 111 or any Garda station. Email “73-year-old man dies after car hits ditch in Kilkenny”. Feedback on “73-year-old man dies after car hits ditch in Kilkenny”.